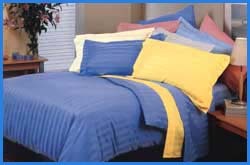 We are one of the largest exporter of finished bedding products out of Thailand. High quality, competitive pricing, and on-time delivery are our policies and this has helped us export to the United Kingdom, The Netherlands, Belgium, Denmark, USA, Japan, Singapore, Malaysia, etc. We also benefit from the fact that bedding products into USA is non-quota and CAT20 into EU is available for free all year round. 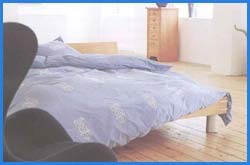 Currently, ready made bedding account for more than 80% of our total export. Our product range includes flat and fitted sheet, pillowcase, duvet cover, bed skirt, mattress protector, curtain, valence, etc. We can sew and pack the products according to your specific requirements.